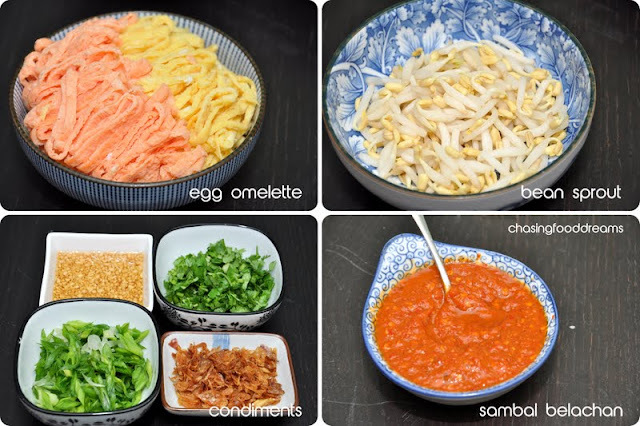 CHASING FOOD DREAMS: Nyonya Lam Mee, My Mom’s Recipe! Nyonya Lam Mee, My Mom’s Recipe! Okay, it took me neon ages to blog about this! Don’t get me wrong, I love cooking as much as I love to eat. In fact, cooking was my top passion before I started this blog. I used to have themed food parties almost every weekend and go wild with lots of food for my friends and family. After settling down to my married life and the little one came, everything took a detour as my priorities changed and the little one became my focus. Then shortly after, I started this blog and the cooking part was further staged aside. All in all, I also procrastinated in drafting a recipe post, simply because I cooked just like my mom. There are no exact measurements in my cooking style and I tend to taste and flavor as I go. Sometimes I even forget how much ingredients I put in at times because I am just too lazy to measure. Hence, the ‘agak agak’ method is not exactly the way my readers would want when looking at a recipe post. Lately, things changed. My life and priorities changed. I begin to cook again. Not sure if the growing old part has anything to do with it but I crave for lots of warm memories of my mother’s cooking. She would spend a whole day in the kitchen just preparing for a meal. Sometimes I looked back and I realized that I had done that too, just before I got married and had the little one. I love my little one and I realized I want him to share my taste of my mother’s cooking so he can have a journey himself. With this said, I am going to try and draft out my mom’s recipe to share with him and everyone. My advice is do not follow strictly to my taste, go have fun and tweak the flavors or ingredients to suit you! What prompted me to start my very first food post in this blog was a Bowl of Memories! As explained in my very first food post in 2010, the dish held a significant endearment in my heart. It’s not anything super special in flavors or even extraordinary to some people but to me, this bowl holds a lot of memories in my life. Growing up, my family was not well-to-do. Celebrating birthdays with presents is barely heard off and in my first 20 years of growing up, my family only had one small party for me when I was ten years old. Even at that time, this was huge to me. I finally had a birthday party and I got a big stuffed dog as a present. Fast forwarding to the present, one day, it suddenly hit me that the only party I had wasn’t that a big deal anymore because my mom has been celebrating my birthdays and all my other family birthdays all along with this special bowl of Lam Mee every year. I was studying abroad in US that time when this hit me and I decided to call up mom and ask for her recipe. And so, I made this Lam Mee for myself during my birthdays far away from home. Cooking this was no easy feat! It didn’t occur to me that Mom had put in so much effort just for this bowl of noodle. Till today, no matter how I replicate her recipe and asked her to show me, somehow, the taste is never the same as hers. My dad is a Baba and mom told me she had to learn from my dad’s sister on Nyonya cuisine after she got married to my dad. This Lam Mee is supposedly to signify a Nyonya’s birthday noodle for longevity. This version is basically a meat stock with yellow noodles and topped with several ingredients. The Lam Mee only has enough stock as seen in the photo and is not meant to be drown in a lot of stock like other regular soupy noodles. Though it looks fairly plain to others but we enjoy this with a Nyonya must-have of the pungent Sambal Belachan a lot. I do admitting to twisting a little in my mom’s recipe but the recipe is 99% what hers is. My bowl of memories tastes sweet and choke full of ingredients! I will literally eat half the noodles as it is and then drown the rest with lots of pungent Sambal Belachan in the broth for extra kicking satisfaction… Before I rambled further down my whole life, here is the Lam Mee’s recipe as promised. For the Lam Mee stock, wash the pork bones and bring these to a boil for 5 minutes in a pot of boiling water to remove the scum. After boiling, discard the water and rinse the bones under running water. Separate the big pork bones and pork ribs. Bring 4 liters of water to a boil in a big stock pot and add in the big pork bones and crushed white peppercorn. Boil under medium heat for 1.5 hours while you prepare the next few ingredients. Boil chicken and pork belly in a small pot of water till cook. Remove bones, and shred chicken meat and sliced up pork belly thinly. Add the meat stock used to boil chicken and pork belly into the earlier pork bone broth. Boil prawns with shell on till cook. Remove the prawns and remove their shells immediately. Put the prawn’s shells back into the boiling prawn water and boil for another 5 minutes. Strained the prawn stock and add the prawn stock into the earlier pot of pork bones stock. Keep the shredded chicken meat, pork belly and prawns covered till everything is ready for eating. *If you prepare this early and will only consume this later, please refrigerate them. Boil the soaked dried scallop using some stock from the big bone pork separately in a small pot for 45 minutes. Alternatively, you can add the dried scallops into the big pork bone stock but it will be hard to fish these out for later consumption. After 45 minutes, add the stock of this dried scallop into the pot of pork stock but save the dried scallop on a separate bowl with a little stock to prevent it from drying out. 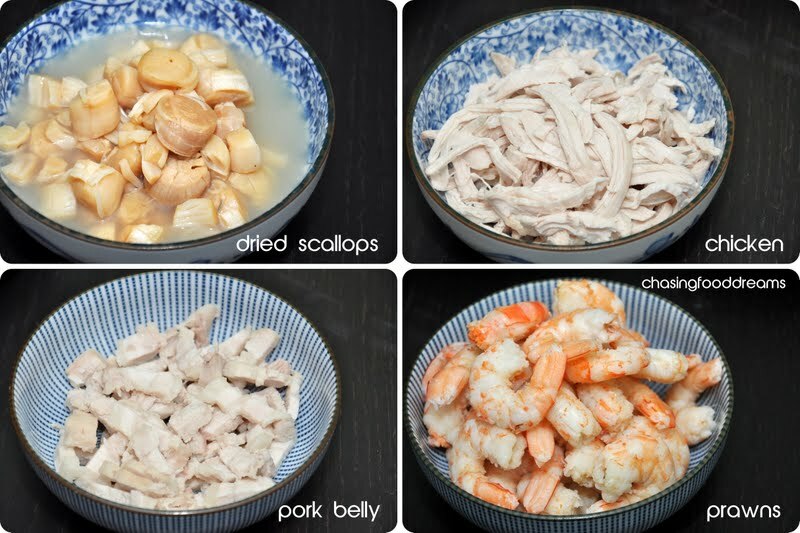 By now, your pork stock should have the other stocks from chicken, pork belly, prawns and dried scallops for about 1.5 hours. Add in pork ribs and boil for another 1 hour and season with some rock sugar. Season the stock with salt and pepper. Total boiling time for pork stock should be about 2.5 to 3 hours at minimum. While waiting for pork stock, prepare egg omelet and cut into thin strips. Traditionally, the egg omelet is tinged with some pink food coloring to signify a birthday celebration. This is optional. For Sambal Belachan, pound red chillies, cili padi and toasted belachan into a thick paste using mortar and pestle else use blended but it will not have the same texture. Add calamansi lime juice to the sambal belachan to make it a little runny. Amount of chilies, belachan and calamansi lime juice varies according to taste. Blanched yellow noodles and bean sprouts in boiling water for 1 min. Get ready every ingredient to assemble the noodles so guests can help themselves or you can do the job of assembly. Put a little bit of chicken, prawn, pork belly, dried scallop, egg omelette and bean sprouts on the noodles. Ladle in hot stock and pieces of pork ribs. Finish off with a drizzle of garlic and oil, fried shallots, spring onions and coriander. Savor with a good dose of Sambal Belachan!! What’s Your Bowl of Memories? I will always treasure this and is dedicating this post to you for giving me this bowl of memories. Happy Mother’s Day to Every Mommy in the World! Interesting! A bit different from my mother's version, also from Penang. I am author of "Penang Heritage Food"